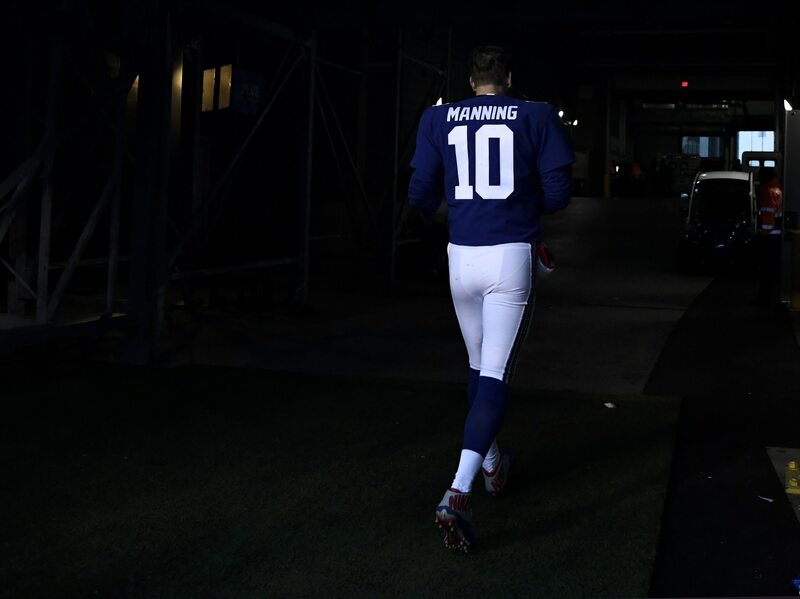 The New York Giants might not be ready to give up on the whole Eli Manning thing. In fact, recent suggestions are that the team might roll with him through the 2020 season. For his part, Manning seems to think New York will select his eventual successor during the 2019 NFL Draft next week. Either way we spin it, New York’s quarterback room will be changing here soon. With the sixth and 17th overall picks in the draft, New York has a unique opportunity to target a successor. Whether embattled general manager David Gettleman actually does that remains to be seen. Should it happen, we’ve decided to rank the five-best potential replacements for Manning in Jersey. Given that the Arizona Cardinals are almost guaranteed to draft Kyler Murray No. 1 overall, this former first-round pick seems to be on the market. Linked primarily to the Washington Redskins, we’re here to say that the Giants make even more sense. A top-10 pick of the Cardinals last year, Rosen could sit behind Manning for a season. He’d learn from a true professional, something that we didn’t see in the desert during Rosen’s rookie season. For the Giants, it would likely only take the team’s second-round pick (37th overall) and maybe a future mid-round pick to land Rosen. This would be the ultimate power move. Arizona wants Murray at No. 1 overall. That’s already known. His relationship with Kliff Kingsbury makes that a marriage made in heaven. However, there’s a scenario in play that suggests Arizona might be playing the PR game in an attempt to acquire a huge bounty in a trade-down scenario. If this is indeed the case, New York could come calling with its two first-round picks, a second rounder and the third-round selection it acquired in the Odell Beckham Jr. trade. That’s a high price to pay. But given the team took a visit from Murray, previous suggestions that New York was not interested in the reigning Heisman winner can be thrown out the window. Is Haskins falling down the draft board leading up to next week’s draft? It’s a strong possibility. It’s also likely that teams looking quarterback are throwing this narrative out to the media in hopes that the Ohio State product falls into their laps. Gettleman isn’t immune from playing this PR game. That’s for sure. In this scenario, New York either hopes that Haskins lands to the team at No. 6 overall or trades up at the top of the draft. One team selecting within the top two is certainly looking to trade down. It would cost a lot less than enticing Arizona in a move up for Murray. We still have no idea what Carr’s future looks like with the Raiders. While the team’s brass has shown outward support of the three-time Pro Bowler, it looks like internal optics are much different. Oakland is interested in both Murray and Haskins. It has three first-round picks to use in a potential trade-up scenario. Jon Gruden might very well want his own quarterback to lead the charge to Vegas in 2020. If Oakland were to land a quarterback, Carr would almost immediately be traded. Much like Rosen, it would likely cost the Giants a second-round pick and change. Carr is more accomplished than Rosen. Whether this is even a possibility depends on what Oakland does next Thursday evening. Let’s be clear here. Wilson would be No. 1 on any list for a team looking to add a quarterback. Despite his self-imposed deadline for an extension passing Monday, there’s still no concrete evidence out there suggesting that Seattle is looking to trade Wilson. That’s all fine and dandy. What we do know is that Seahawks general manager John Schneider has pushed back against offering up lucrative extensions to veteran players. We also know that the Giants, probably more than any other team outside of Oakland, have the assets to land Wilson. Whether Seattle even entertains offers remains to be seen. Even if the team were to do that, New York would likely be looking at three first-round picks as a starting-off point. Is Wilson worth that?